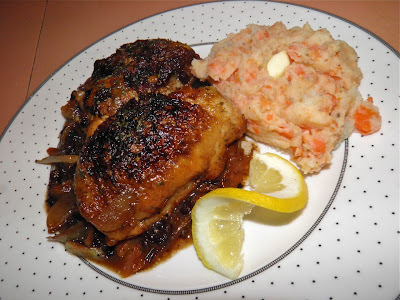 Chicken in blackberry vinegar, with carrot potato mash. This recipe epitomizes piquancy to me. One look at the ingredients list will show you why. Currants, onions, blackberry vinegar… all ingredients that add to the complexity of the sauce that accompanies this moist, flavourful dish. Cooking chicken in vinegar is a technique common all over the world. In the Philippines it is called adobo. 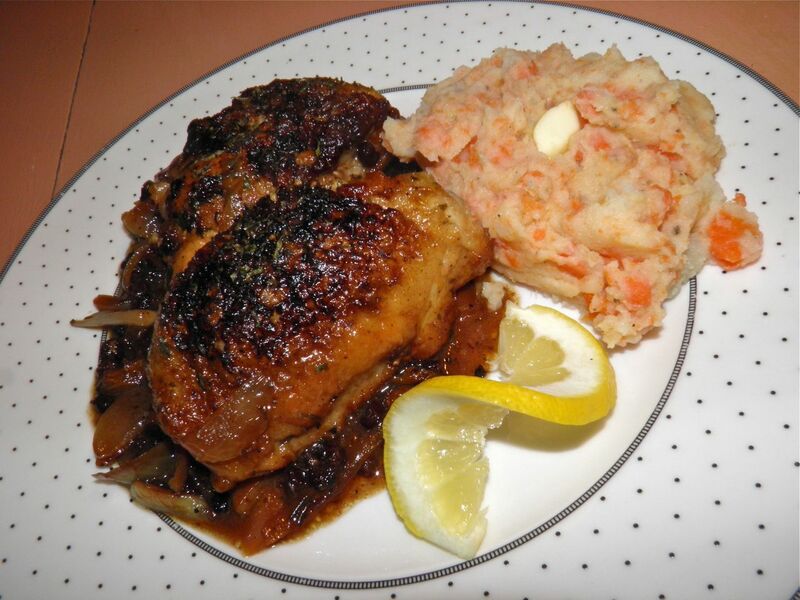 The Italian have a recipe for vinegar stewed chicken that calls for anchovy and rosemary. Central European countries all have versions. North America is not immune either. One would almost believe there are as many variations on it as there are cooks in the world. This night I opted for something on the French side of things. If you're a little leery of cooking chicken with vinegar just think of the vinegar in another way. Vinegar and wine are not all that separate. You will know this if you've inadvertently tasted some wine that has gone beyond its "best before" date. 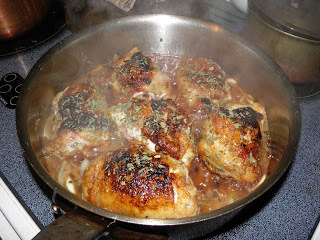 Coq au vin is a classic example of chicken cooked in wine. But sometimes a dish can benefit from a little more acidity than wine alone can deliver (or you're too poor to have wine in the house which was the case in the history of that dish). 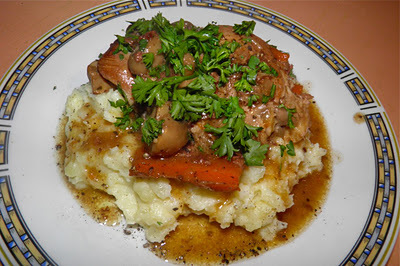 Classic coq au vin is delicious, when prepared correctly (to see my version, and some history, click HERE). I used to date someone who thought they could cook coq au vin and were quite proud of what they prepared. It was a train wreck. Once I rescued myself from that relationship I rescued the recipe as well. If you know the British slang definition of "plonk" you know what was used for wine. If you don't, you should look it up. far less expensive than purchasing gourmet vinegar. But back to the (far better) present… I wanted something with sweetness and tartness this night for dinner. Cooking chicken with vinegar and fruit could be classed as a European version of "sweet and sour." But that would be doing it an injustice. 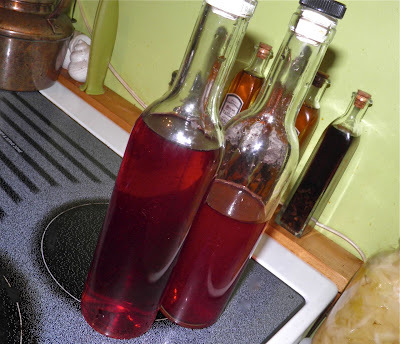 I chose my own very easy homemade blackberry vinegar (recipe HERE) because I knew it would complement the dried fruit exceedingly well. As I said before, this recipe is piquant. It isn't overwhelmingly acidic. The sweetness of the currants and onions serve as a perfect counterpoint to the fruity vinegar. The preparation is actually very simple. Deal with the chicken, then make the sauce and finish steam-cooking the chicken right in the sauce. That technique infuses the chicken with all the flavours. Of course no good pan sauce is complete without whisking a little butter in at the last minute. That final addition makes a smooth, rich sauce to pour over your chicken as you plate for your family or friends. so it can finish cooking. Place the flour, salt, 1 tsp of the pepper and paprika in a plastic bag. Shake well to combine. Then add the chicken and shake to coat. Preheat a large sauté pan on medium high. Place the chicken skin side up, in the dry, hot pan. Let the chicken cook until browned and it releases from the pan, about 5 minutes. Chicken fat will render out as it cooks. Turn the chicken skin side down and cook until that side is browned and releases. Turn and cook on the other side. The total time should only be about 12 minutes. Remove the chicken to a plate. Add the currants, onion and garlic to the chicken fat and let cook for 5 minutes until the onions have softened slightly. After the onions are softened, add the stock, blackberry vinegar and lemon juice and bring to a simmer. Scrape the brown bits off the bottom of the pan. Place the chicken back in the pan on top of the onions and sprinkle with the tarragon and remaining pepper. Cover (slightly ajar), and reduce the heat to medium. Let the chicken simmer for 12 minutes – with the cover slightly off – so the sauce reduces as the chicken finishes cooking. Remove the chicken to a plate. Turn off the heat and finish the sauce by adding the butter and whisking it in until melted.